The best thin crust pizza dough. Cold rise, thin crust, crispy, perfect pizza. You will never need another pizza dough recipe. Ah, pizza. One of the best foods ever invented. Am I right? Of course I am. Everyone loves pizza. I have been on the hunt for the perfect pizza dough recipe for years. YEARS. I have tried so many recipes, and none of them have quite measured up. Many years ago (I feel really old when I count how many so I’m not even going to bother) I spent about 6 months living in Germany and attending a Bible college there. There were a few things that I remember eating there for the first time and loving – donairs, apple pastries and chocolate croissants among them. But the other thing that was just fantastic was the pizza. It was in the south of Germany so close enough to Italy to get the real thing maybe? I don’t know. What I do know is that there was a little pizza place a couple blocks from the school where I had thin crust pizza for the first time. Before that, I’d only ever had the usual takeout pizza, and thin crust wasn’t really a thing at the time at home (I told you it was a long time ago). The pizza in that little restaurant was the best pizza I had ever eaten. So of course I’ve been trying to recreate it (and/or find it somewhere) ever since. This is it. Perfect thin crust pizza dough. So good that I’m not even trying to adapt it in any way, shape or form. I found this recipe in one of my favourite cookbooks, The Bread Baker’s Apprentice by Peter Reinhardt. And loved it. So I decided that there is no reason to make another version of it as this one is perfect. So it’s lucky for me (and you!) that he is allowing me to share his recipe here, because otherwise you’d all be missing out. And we can’t have that. 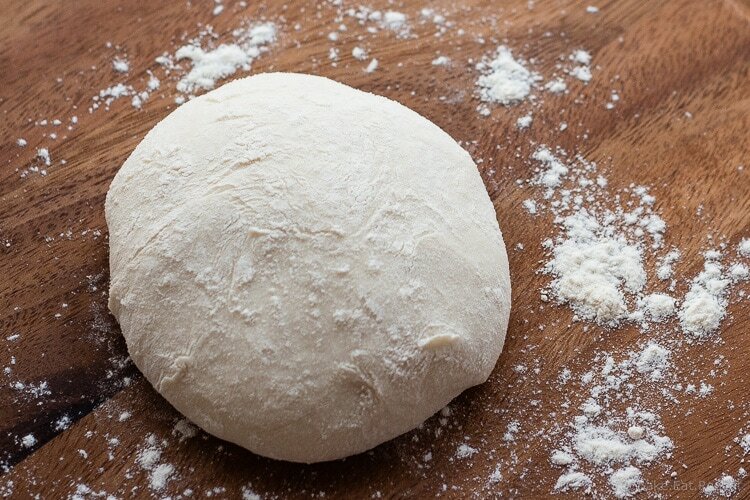 If you’ve been searching for the perfect thin crust pizza dough recipe too, look no further. This is it. It does take some planning ahead, as it needs to rise overnight in the fridge, but trust me, it’s worth the time. I also just found out that Peter Reinhardt has another cookbook all about pizza. Fairly certain I need that in my life soon! In the bowl of a stand mixer, or in a large bowl, stir together the flour, salt and yeast. Add the olive oil and cold water and knead with the dough hook for 5-7 minutes, or 8-10 if kneading by hand. The dough should be smooth and elastic, and clear the sides of the bowl (it will be fairly sticky, but as long as it clears the sides of the bowl that’s okay - if if doesn’t clear the sides, sprinkle in a little more flour). Line a baking sheet with parchment paper and lightly spray it with cooking spray. 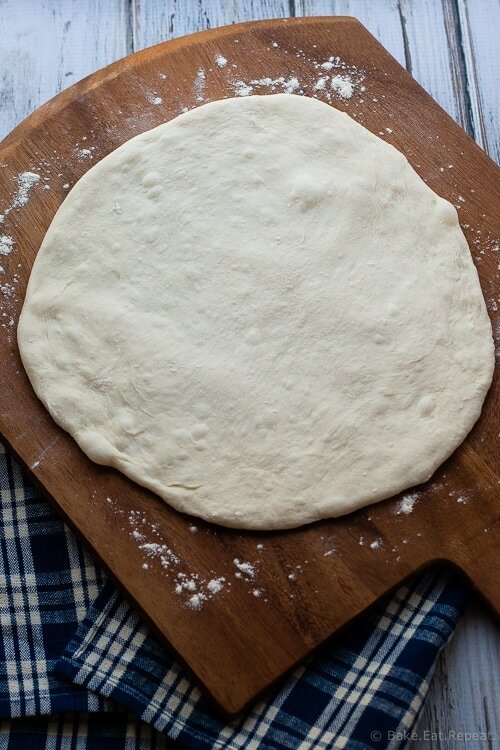 Transfer the dough to a lightly floured countertop and cut it into 4 equal pieces (or 6 if you want smaller pizzas). Gently shape each piece into a ball with floured hands and place it on the prepared cookie sheet. Mist the dough balls with spray oil and lightly cover them with plastic wrap. Place the pan into the refrigerator overnight, or for up to 3 days. You can also freeze the dough balls at this point, by placing the oiled dough balls into individual freezer bags for up to 3 months, removing them to the fridge the day before using them. The day you want to make pizza, remove the dough to room temperature 2 hours before making pizza. On a floured counter, flatten the cold dough into 1/2 inch thick disks, spray lightly with oil and then cover them to rest for two hours. Preheat the oven 45 minutes before baking the pizza to 500 degrees F. With floured hands, stretch the dough out to 12 inch rounds, using the backs of your hands and your knuckles to do so. It will get quite thin without breaking. When it is stretched as large as you like, add the toppings you like (remembering it’s a thin crust so it’s best with fewer toppings!) and bake for 7-9 minutes or until lightly browned. I like to prepare my pizza on a sheet of parchment paper and then slide the paper with the pizza directly onto a hot pizza stone in the oven. If you don’t have a pizza stone, a cookie sheet turned upside down and heated in the oven works well too. Just place your stone or cookie sheet into the oven to heat when you turn on the oven. Once cooked, slide the parchment with the pizza back out of the oven onto a cutting board. Wait 5 minutes before slicing for the cheese to set. The actual hands on time with this dough is maybe 30 minutes, probably less, but you do need to plan ahead. It needs to be made at least a day ahead and up to 3 days ahead of time and it rises in the refrigerator. It can be used the day it's made but it isn't as amazing as it is when it has the cold rise time. You also need to let the dough warm up to room temperature for about 2 hours before using it. Also, if you have a kitchen scale, use it for measuring the flour. I always get much better results with yeast doughs when I weigh the flour rather than measuring by the cup. If you're not weighing, use the scoop and sweep method for the flour to get the most accurate measurement you can. Source: Printed with permission from The Bread Baker's Apprentice . Will using Caputo 00 flour change the dough at all? Sorry, Rebecca, I've never tried it so I can't say for sure. I've only ever made this dough with all purpose flour and sometimes half whole wheat flour. This odd recipe is a gem. I have made this recipe 7 times now with beautiful results every time. I have experimented with it a bit. After you pull the doh out of the freezer or fridge, if you leave it on the counter longer (about 6 HRS) the crust will turn out thicker. This recipe also makes amazing bread dumplings for stew. If you roll up hot dogs and bake them, your kids will probably like you more that day. Want to make several pizzas for a pizza night with several friends. Can I prep the crusts before they come and put it on parchment paper? I haven't tried it but it should work just fine - just cover them lightly with plastic wrap once they're prepped and if it's going to be more then a half hour or so ahead of time then keep them in the fridge as well. Do you think this pizza dough would do well in an outdoor brick pizza oven. I have yet to find a good pizza dough for the brick oven. Hi Josephine - I haven't tried it as I don't have a brick pizza oven, but I would imagine it would work well. In the cookbook that I got the recipe from it says to bake it at as high a temperature as your oven goes to, but that it's even better done in a proper pizza oven since it's hotter. I'm guessing you won't need to bake it as long since your pizza oven is likely a higher temperature though, so keep an eye on it! Good luck! I don't know why outside of Italy corn meal is used to slide the dough in the oven! First does not taste good and it is absolutely unnecessary! In Italy (my home) cornmeal is not used ever. I thought for sure I had done this wrong. I wanted to use my new kitchenaid so I tried it. I was a sticky mess! But I kept at it, followed the directions and the next day we ate four good sized, delicious pizzas!!! My dough never pulled off the sides of my bowl so maybe be I should have kept adding flour? I was just afraid I'd overwork it. I got it wrapped and in the frig, and the next day it hadn't really puffed. The magic happens when you let it rest for two hours!!! It puffed up great! My son had trouble working with it because it's not anything like our typical dough. I just floured my hands and gently used my fingertips. It spread out beautifully!! I used a round pizza pan and an inverted cookie sheet. Worked great but I did add a minute or two baking time to get the bottom crisp. Yum!! Yesterday I didn't think I'd ever try it again, but today it became a keeper!!! I would suggest holding off on adding the oil until the water is absorbed into the flour. Adding the oil too soon prevents the flour from properly hydrating. That's how most pros do it. Hi Shirley - sorry, thought I had the grams in that recipe already! The weights are added to it now. I'm from Chicago and my favorite pizza restaurant there is said to use beer in their crust. Have you tried using ice cold beer instead of the water? Can you make this with active yeast, or does it have to be instant? Hi Emily - I've never tried this recipe with active yeast, but I think it would be okay. The only problem is that unlike regular bread doughs, this recipe is a cold rise recipe, so you don't use warm water in the dough, but ice cold water. With active yeast you need to proof the yeast in warm water before using it. That being said, I think since you still do the long rise in the refrigerator you could probably get away with using warm water in the dough so you can proof the yeast first and then mix in the rest of the ingredients. Since I've never tried it though, I can't say that it would turn out exactly the same, but I think it would still be good. Let me know if you try it! Hi Stuart - I always bake my pizza in the middle of the oven. Hope you like the recipe! When I get to step 3, I've found that turning out the dough onto the center of your floured parchment rather than the countertop is much simpler because the dough is difficult to handle and tends to easily stretch out of shape. I get perfectly round pizzas this way. Hi Minaal - I have made this with half whole wheat and it's great, I haven't yet tried this recipe with 100% whole wheat flour though. I think you will want to knead the dough for a couple extra minutes if you try that. I haven't tried mixing the ingredients in a bread maker, but I don't see why you couldn't do that! Hope you like the pizza! I'm used to the type of pizza dough you can actually handle without it tearing or clinging to whatever it touches, so this sticky version was challenging for me. As long as you follow the instructions to the letter, you end up with a very nice crust. Do NOT try to use a rolling pin or you'll end up kicking yourself. LOL My husband says he likes it much better than my old recipe, and I like working with the smaller-sized dough pieces when making the pizzas. They're much easier to get onto to stone than a 16-incher. It's a keeper - today is my third time making this. This dough is fabulous! This time I am going to use ice cold as a substitute for the water. I have made other pizza doughs at home and I always see the dough rise significantly. This did not seem to rise much in the fridge. Does it rise at all when you let it set for two hours before baking? Pictures of the process in the fridge would be a great reference. Thanks! Hi Courtney - someone else mentioned more pictures on this recipe would be good, so I will definitely try to add that next time I make it! It doesn't look like it's risen much in the fridge, no. It's a very slow rise doing it overnight in the fridge and it won't look like most bread doughs where you wait until it's doubled in size. Once you take it out to warm up it will rise a bit more, but it still doesn't quite double. You'll be able to feel the air bubbles in the dough when you start stretching it though. Hope that helps a bit! Hi Stacey, Just stumble across your blog.....Like u i havé been searching for a "go to " thin crust pizza dough forever .....going to give it a try next week ! Thanks for sharing. Can you post a picture of the finished product ? Hi Mike - I'm not sure how well this recipe will work for a thicker crust as I've never tried it. I would guess if you use double the amount of dough for the same size crust it would work okay, but you would likely need to bake it for another 3-4 minutes or so. If you try it as a thicker crust let me know how it turns out! I do have a no-rise pizza dough recipe that I'll be posting soon that I've made both thick and thin and it works well as both - so maybe this one would work for both too, I just haven't tried it! To make a thicker dough, increase the yeast slightly and the water weight up to 70% of the flour weight. Yes it can, it freezes very well. There are freezing instructions within the recipe directions. Typically when I make it I use half the dough within the next couple days and freeze the other half for another time. Hi Stacey, Thanks for the recipe. Do you usually let it rest in the fridge for a couple of days before freezing or can it be frozen straight away? Either way works - I usually let it do the slow rise in the fridge overnight and then freeze it. But you can also freeze it right away and then let it rest in the fridge for a couple of days before you plan to use it. I love making pizza dough, but I have always made it in a bread maker. I wondered if I was missing something though. Thanks for the great tips! Will have to try this. I love making my own pizza dough! 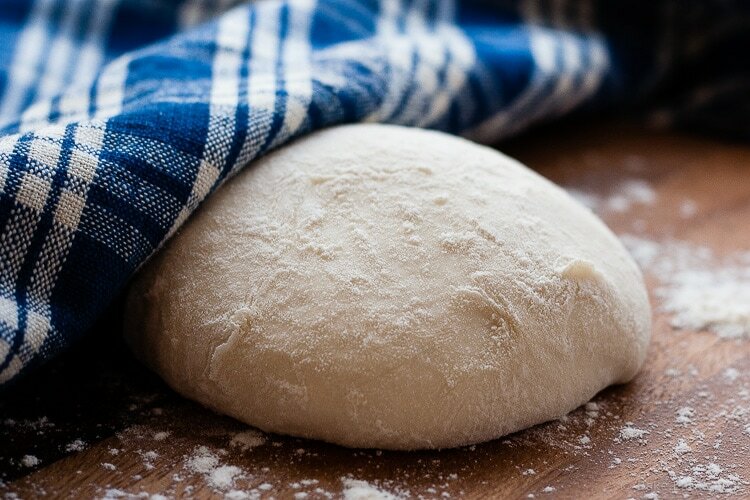 I've yet to try making a thin crust dough, but this recipe is a great place to start! Thanks for sharing!